Most people don’t realize that 8 out of 10 fire deaths occur in the home. They usually happen at night when you and your family are asleep. Fires are also fast; they can go from a very tiny flame to total destruction in as little as three minutes. Fire sprinklers can suppress and extinguish a fire before the fire department arrives, giving your family time to escape. Home Fires: No Prevention Strategy Has as Much Documented Life Safety Effectiveness as Fire Sprinklers!!! The fire problem in the U.S. is overwhelmingly a home fire problem. According to the National Fire Protection Association’s (NFPA) latest U.S. data, 92% of all civilian structure ﬁre deaths resulted from home structure ﬁres. Quite clearly, any improvements in overall fire safety must be improvements in home fire safety, and no strategy has as much documented life safety effectiveness as installed fire sprinkler systems. Homes Burn, Whether New or Old Few fatal home fires involve installed features of homes. Instead, they usually involve the actions and errors of the occupants in combination with the flaws and vulnerabilities of products brought into the home. New homes benefit from fire sprinkler protection as much as older homes. Fires Today “Burn Faster and Kill Quicker” Research conducted by the National Institute of Standards and Technology (NIST) has shown that home fires become deadly in as few as three minutes. “Fires today seem to burn faster and kill quicker, because the contents of modern homes (such as furnishings) can burn faster and more intensely,” says NIST senior engineer Richard Bukowski, P.E..
New and old homes alike are filled with these newer contents and furnishings, which provide fewer margins for success for smoke alarms and add to the need for fire sprinklers. Modern lightweight home construction products, especially wood truss roof systems and wood joists, can rapidly fail under fire conditions, an extreme risk to firefighters responding to a fire. Smoke Alarms working smoke alarms provides valuable early warning in dwellings. American Eagle Fire Protection Services recommends that every home have smoke alarms installed on each level. For smoke alarms to be effective, occupants must react quickly and escape immediately when the alarm warns of a fire. American Eagle Fire Protection Services will install your smoke alarms. Every household should hold regular fire drills to practice how to properly respond to a smoke detector or fire system activation. Smoke alarms are designed only to signal a warning, which gives residents time to put their escape plan into action. Many high-risk populations – infants, children, people with disabilities, older adults – can have difficulty hearing and waking to smoke alarms, and difficulty reacting quickly and effectively enough for a safe escape. Their lives depend on stopping the fire early in its development. Their lives depend on fire sprinklers. Fire sprinklers provide a level of protection that no other fire protection technology can offer. Like smoke alarms, sprinklers detect a fire; but they do even more. Fire sprinklers automatically respond to a fire while it is still small, controlling the spread of deadly heat, flames and toxic smoke. Fire sprinklers are effective whether or not the residents have responded to the smoke alarm. Fire sprinklers make up for human error, and they provide a life-saving cushion for a time-consuming escape. In most settings where there is a municipal water supply, sprinklers operate off the household water main. When the water supply is a well, or there is not enough water pressure, a holding tank is used. Sprinklers are linked by a network of piping, typically hidden behind walls and ceilings. The high temperature of an early-stage fire (135˚-165˚F) will cause the sprinkler to activate. Only this high heat initiates the sprinkler to flow water (neither smoke nor a smoke alarm can activate a fire sprinkler). Only the sprinkler closest to the fire will operate, flowing water directly on the flames in the area of the fire’s origin. This quick action controls or extinguishes the flames (often before the fire department arrives). Fire sprinklers slow the spread of deadly heat and toxic smoke, preventing flashover. This also provides residents with more time to safely escape. Unlike interconnected smoke alarms (if one signals, they all signal), fire sprinklers activate independently. 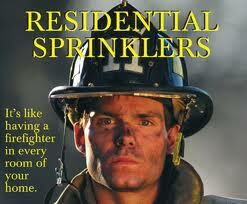 In a survey of home fires*, 90% of the time a single sprinkler was sufficient to control the fire. Despite the fictional special effects commonly seen in action movies, fire sprinklers do not spray water all at once. They do not operate in response to smoke, burned toast, cooking vapors, steam, an activating smoke alarm, or anything other than high heat. Home fire sprinkler systems require very little maintenance. In fact, the sprinklers themselves require nothing more than an occasional look to ensure they are not painted and that nothing is hanging from them, or blocking them. Valves should be similarly checked to ensure they are turned on. According to the National Fire Protection Association, once a month, homeowners or sprinkler contractors should test the pump (if any) and visually verify that all valves are open and the storage tank (if any) is full. Twice a year, the water ﬂow device and monitoring service (if any) should be tested. That’s it. of antifreeze. When antifreeze is used, NFPA recommends the minimum concentration necessary for the lowest anticipated temperatures. A national 2008 report from the Fire Protection Research Foundation found that the average cost to builders to install sprinklers in new homes was $1.61 per sprinklered square foot. Reduced labor costs and municipal trade-up incentives have made fire sprinklers a valuable way for homebuilders to protect their bottom line. 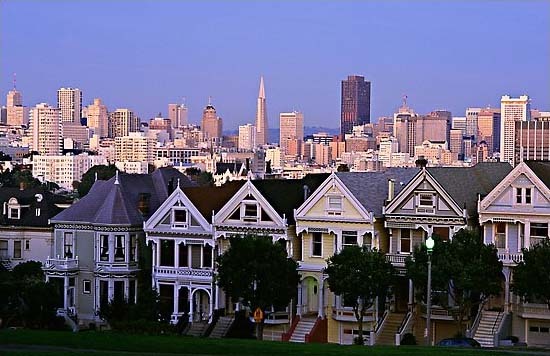 Options vary by jurisdiction, but typical trade ups for a sprinklered residential development or sub-division include street width reduction, additional units, and increased hydrant spacing. Another Foundation study, conducted in 2010, evaluated incentives in 16 communities. Including fire sprinklers in your new home is a great idea that can save your family members lives. But it does raise many questions. How much should I expect to pay for my fire sprinkler system? If installed during new construction of your home, home fire sprinklers cost on an average $2.50 per square foot of sprinklered space, which is about what you might pay for new carpet, window coverings, counter tops, garage door, etc… The investment in your family’s fire protection may be slightly lower or higher, depending on the location and complexity of the home. Specialty fire protection systems may cost between $4.50 to $9.85 per square foot of sprinklered space. A specialty fire system may be a kitchen fire system over your cooking appliances or a wildfire protection system. Fire sprinkler installations are like electrical, plumbing, HVAC, irrigation, security or any operational system in your home. The total time involved will depend on the size and complexity of your home. Certain portions of the fire system (i.e. water piping) are more easily and cost-effectively installed in the earliest stages of the construction, while the actual finish (i.e. installing the fire devices, testing the system, etc.) will take place after the house is framed. 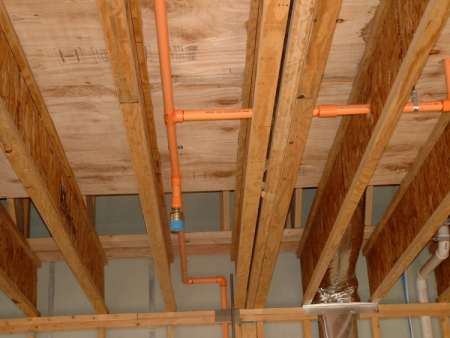 Fire sprinkler systems are often completed prior to the other systems in your home, but other mechanical trades may work alongside us if necessary. Residential fire sprinkler systems are basically maintenance free. The only testing required on a regular basis is opening the drain/test valve to check for alarm activation and sufficient water flow to operate the fire system. A yearly certificate of operation is highly recommended to maintain a high degree of performance in your system and to take full advantage of insurance discounts. For the most part your residential fire sprinkler system is designed to operate properly for 20 years or more without any maintenance. Homes can be protected by automatic fire sprinklers in even the most remote areas. American Eagle Fire Protection Services offer several types of water storage tanks and pumping systems to augment any water flow issues. These tank and pump units are designed to fit in your garage or other storage area of the home, and they hold enough water to comply with the National Fire Protection Association standard 13 D, standard for the installation of fire sprinkler systems in one and two family dwellings and manufactured homes. No. Generally insurance rates go down because fire sprinklers will keep damage low. Shop around; the savings vary by insurance company. American Eagle Fire Protection Services can inspect any residential fire protection system with state certified inspectors, supplying a state certification of safe operation of your residential fire protection systems and equipment for a 12 month period of time at very low rates compared to the dollar savings and peace of mind. This annual certification should bring you even added savings per year from your insurance company. Yes you can. In most cases you may be able to use the existing main water supply for your fire system. There may be some drywall to be removed from the walls or ceiling in a method called channeling. The drywall can be replaced and textured without a problem. We will do that as well, 100% turnkey from start to finish. We will take care of everything. You can hide fire sprinkler pipe in soffits and behind crown molding as well thus saving in drywall work. If you like that turn of the century look with exposed piping you could have an architecturally pleasing fire system made of copper, brass, iron or stainless steel. Give us a call… We can Inspect, Design, maintain and install all residential fire protection systems and equipment. All quotes for services are free for the asking. These fire sprinkler systems are designed to supress any interior fire that may occur. Interior systems also provide you with maximun safety in a shelter-in-place scenerio. These are the same kind of fire sprinkler systems used in homes and offices throughout the U.S.
Give us a call and we will give you a quote on a Fire Sprinkler Sysytem for your Home, Barn, Office or Warehouse. In the Mountains or in the Cities, where ever you need to be fire safe. Wildfire Protection anywhere you need us! 100% protected 100% of the time. 100% guaranteed. 100% period. American Eagle Fire Protection Services Corp. can design, install, maintain and inspect all Residential Fire Sprinkler Systems. Single family homes; multi-family homes and communities; and new & re-model installations with no architectural limitiations.